What are the names of the steamboat and tug? 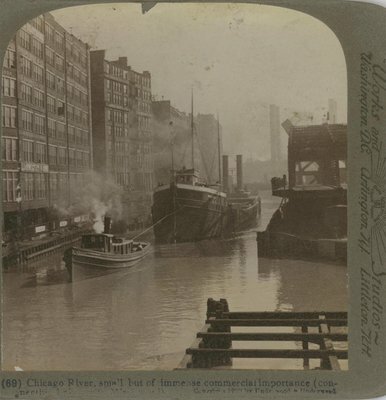 Stereoview of tugboat towing steamboat out of the Chicago River past an open swing bridge. "(69) Chicago River, small but of immense commercial importance (connecting Lakes and Mississippi" "Copyright 1904 by Underwood & Underwood". "Underwood & Underwood, Publishers New York, London, Toronto-Canada. Ottawa-Kansas"
You are facing nearly west; Lake Michigan is behind you. That vessel has loaded with grain at one of the big elevators and is now being towed out into the lake. At the right you see part of a bridge which carries one of the business streets across this little stream. Its support is in the middle of the river (you see only half of the river's width at this moment) and, when a vessel must pass, the parts which should span the channel swing around parallel with the channel, as you see the section now. Just beyond, starting up through the sn[ ] so characteristic of [ ] kind of bridge which [ ]. This s[ ]a little beyond ] the North and South Branches [ ]. Now its course has been turned in the opposite direction by menas of a great canal nearly forty miles long, connecting it with the D[ ] River and so with the Mississippi. Navigation is to be made open for freight boats from the Great Lakes direct to the Gulf; this is a movement of immense industrial importance, for Chicago is the largest railway center in the world receiving and distributing the greater part of the products of the immense west. From Descriptive Bulletin No. 3, copyrighted, 1904, by Underwood & Underwood.